After finding it difficult in the past to maintain a consistent foothold in the UK’s notoriously tough home cinema/media room projection market, Taiwanese brand Vivitek now has a committed distributor keen to show British movie fans what its DLP models can do. Which, on the evidence of the well- priced HK2288, is a heck of a lot. 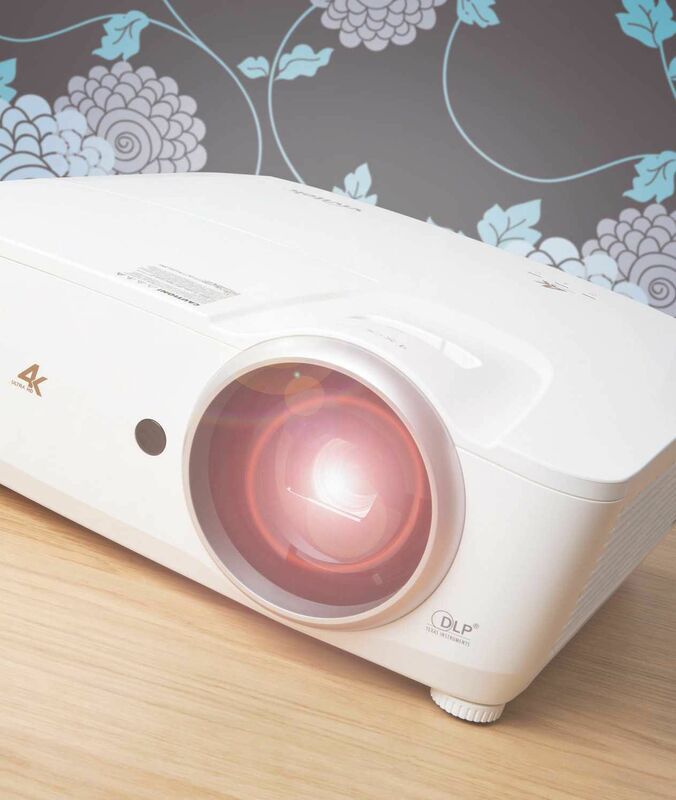 This projector is the latest in a rapidly growing line of affordable 4K DLP models using Texas Instruments’ XPR fast-switching technology. The imaging chip isn’t native 4K (it incorporates 4.15m mirrors), but Tl’s proprietary processing claims to deliver two discrete pixels for each mirror – resulting in a 4K picture. From my experience, the technology gets closer to a true 4K experience than any rival ’pseudo’ technology – and has been certified as ‘real 4K’ by America’s Consumer Technology Association. The projector is small enough not to overwhelm either a typical coffee table or your ceiling, but isn’t of the compact, portable ilk. Curved edges give it a classy appearance, while side-mounted vents link to its internal cooling fans – be aware that these make a fair bit of noise with the lamp set to Boost mode for HDR playback. Connections are found on the rear panel. Unusually, there are three HDMI inputs, and each of these can accommodate 18Gbps data streams. There’s also a USB port for powering a Chromecast or other streaming dongle, and a 3.5mm audio output (the projecter carries a built in 10W mono speaker). However, there’s no 12V trigger output, which is a potential deal-breaker for anyone already running an automated screen setup. Accompanying the PJ is one of the more helpful remote controls I’ve encountered. It’s a comfortable size, and its well labelled buttons light up brightly when pressed. Setup flexibility is fair far the price, but not outstanding. Optical zoom extends to 1.5x (providing a 1.39-2.09:1 throw ratio), and is joined by vertical image shifting. Focusing your picture is done via an impressively responsive lever on the lens’s front. The HK2288’s onscreen menus aren’t very intuitively organised, but do contain enough adjustments to keep tweakers happy if you hunt them down. And hunt them down you should, for two main reasons. First, out of the box my pictures contained a fairly distinct green tone that needed to be dialled away. Second, to get the best out of the HK2288 you’ll need to commit to changing its HDR settings pretty regularly. With its reasonably high claimed brightness of 2,000 Lumens and promising claimed contrast ratio of 1,000,000:1, the HK2288 is more capable than arguably any sub-£3,000 projector of making HDR fun to watch. But only if you put in some legwork. For instance, if you’re watching an Ultra HD Blu-ray that’s been mastered at 1,000 nits or less of peak brightness (as most are), you can get away with selecting the ‘Normal HDR’ picture preset. If, however, you’re watching a title that’s been mastered at a higher peak luminance level, you should use the ‘Detail HDR’ setting, and additionally reduce the brightness and contrast levels (to around 43 and 46 respectively). and tell you what peak brightness each 4K Blu-ray disc has been mastered to. But it doesn’t. So all there is to go on is that Warner and Universal titles are more likely to be mastered to 4,000 nits than titles from other studios. As are titles that carry a Dolby Vision master (even though the HK2288 can’t decode Dolby Vision’s dynamic metadata). I appreciate that this is hardly a bulletproof method. You may then want to have a quick look at a 4K HDR movie and adjust your settings before settling down to watch it in earnest. Any effort you put into optimising the HK2288 for each title is rewarded with some excitingly good picture quality. There’s a lush brightness here that’s particularly impressive. The snowy exteriors of Murder on the Orient Express (4K Blu-ray) enjoy a high baseline luminance that appears much punchier than the picture you get when watching the same scenes from the SDR 1080p Blu-ray. There’s also noticeably more intensity to the brightest parts of the picture – such as the direct shot of the sun in the film’s opening sequence, or the various electric light sources on the titular train. One shot of a small train station at night also contains a wider range of light from the image’s darkest to brightest parts than budget 4K projectors usually muster. This brightness opens up Murder…’s rich colour palette beyond the reach of the HD Blu-ray – despite the fact there doesn’t appear to be anything about the HK2288’s RGBRGB colour wheel and optical system that should support a wide colour presentation. Variations in light are well balanced during HDR viewing. As Poirot walks along the roof of the train against a very bright backdrop of snow and sunshine, there are still healthy levels of colour information and detail in his relatively dark, foregrounded form. He doesn’t just become a flat silhouette. Overall black level performance isn’t brilliant, however; dark scenes tend to look quite grey. This is par for the course at this level of the HDR projector market, though, and doesn’t stop the HK2288 from providing plenty of detail in Murder…’s night-time scenes. HDR material comes in. If you opt for a more reined-in light output when viewing the brightest HDR content, the clipping reduces dramatically. And if you’re careful enough with the settings, you can achieve this without the picture becoming depressingly dark. The HK2288 delivers even the smallest, brightest light peaks of HDR pictures while suffering only very slightly with DLP’s colour striping ‘rainbow effect’. And despite clearly being tuned with HDR in mind, it adapts very well to standard dynamic range playback where an HDR source isn’t available. SDR colours still look nuanced and authentic, and – as you’d hope from a projector capable of handling HDR brightness levels so well – the HK2288 has no problem picking out contrast subtleties from SDR sources. 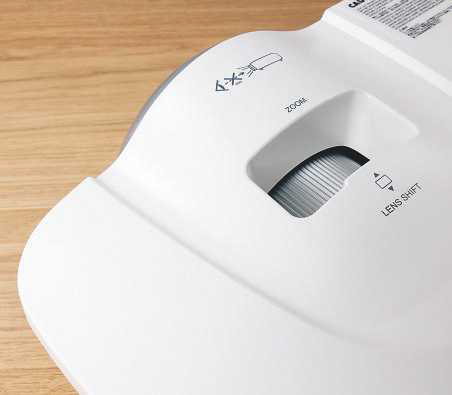 The agility of its light production, together with little sign of single-chip DLP projectors’ common fizzing noise issues and some natural-looking motion handling, also helps the HK2288 sell its 4K claims. The weave of Poirot’s exquisite suits and each hair of his extraordinary moustache are beautifully rendered from the film’s crisp, clean 4K Blu-ray image. 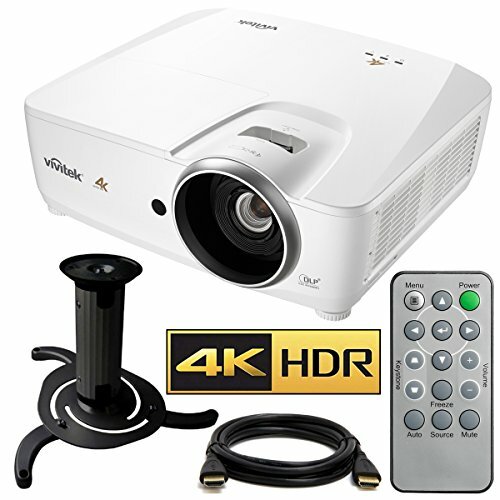 So long as you invest a little time in it, Vivitek’s HK2288 delivers as assured an HDR and 4K picture performance as any affordable DLP projector we’ve seen. Packing a REC10, HDR10, DLP DarkChip3, BrilliantColor and a 6-segment (RGBRGB) color wheel, these new HK2288 ensures that projected images and videos are displayed with optimal black levels and vibrant colors.